Deliver a presentation at a South Florida CLT event, workshop or conference. The winners will be awarded $2,500 and recognized widely at South Florida CLT events, through email announcements, social media, on our website and by partner organizations. 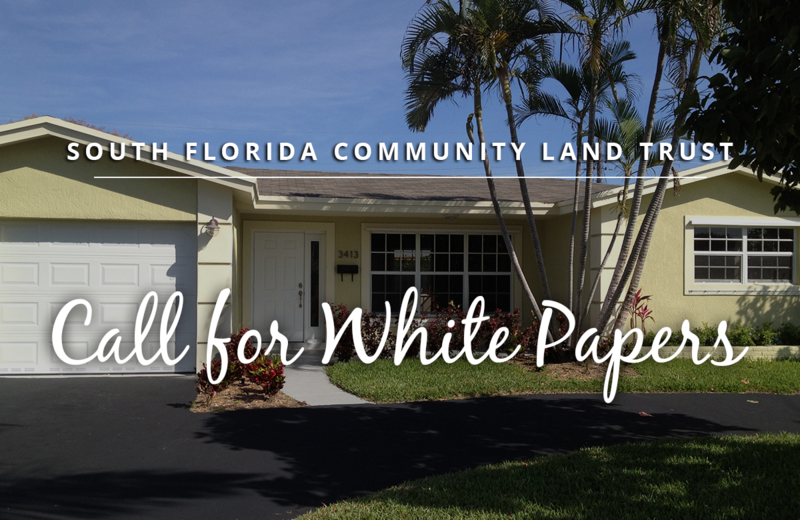 White Paper proposals are due March 10, 2017 and should address key issues of affordability and answer Community Land Trust questions as they relate specifically to Miami-Dade County. Creation of “calculators” for equity and subsidy savings. Outstanding proposals will explain why the specific issue or question chosen is timely and important to Community Land Trusts; describe how the final product will integrate the available evidence with the researcher’s own insights and/or primary research; and suggest how policymakers can make wise decisions in the face of insufficient or conflicting evidence. Prepare an Abstract of 500 words or less that addresses key affordable housing and CLT issues in Miami-Dade that includes the specific policy question that your White Paper will address. How is the question important and pertinent to South Florida CLT and the Miami-Dade community? Abstracts are due: March 10, 2017. Introduction – What question is this research trying to answer? Why is it an important question for affordable housing in Miami-Dade? Approach and Methods – Description of relevant statistical methods used, including data sources or data collection procedures. Results – Description of policy recommendations that are applicable and have a high likelihood of implementation. How will South Florida CLT implement? Conclusion – The overall takeaway from the study, including how the results will impact affordable housing. The White Paper should emphasize policy recommendations and solutions. Data needs to be concise. Explain how your professional and/or academic background makes you particularly qualified to address this issue. Include an abbreviated CV or resume for you and your team. Send the Structured Abstract and CV/resume to research@southfloridaclt.org no later than March 10, 2017. Based on the judged merits of their Abstract submissions, a review panel will review all Abstracts and select winners by March 31, 2017. Each winner will be notified shortly thereafter. Final white papers will be due on June 20, 2017. Progress reports and drafts may be requested in the interim. Papers that have been previously published elsewhere are not eligible for the competition. However, this could be an extension of existing research that re-focuses on the CLT Model in Miami-Dade and the expansion of the South Florida CLT into the area. All final submissions will be jointly owned by the South Florida CLT and the author. Further information on the South Florida Community Land Trust can be found at https://southfloridaclt.org/. A downloadable copy of this solicitation is available here.